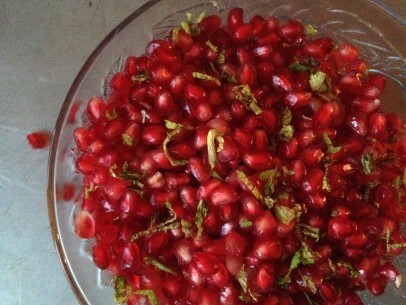 For many people, the pleasure of enjoying these beauties is tempered by the often times messy affair that peeling and seeding a pomegranate can be. I’m here to tell you, there’s no need to fear – The Greek Vegan is here! This post will quickly tell you how to know when a pomegranate is ripe and show you the quickest/cleanest way to peel and seed this fantastic fruit. You can do it, I promise!, and you’ll never be intimidated by a pretty pom again! First, lets go over how to know when your pom is ready to peel and seed. Often, the fruit at the grocery store will be unripe and need a week or so on your kitchen counter to reach peak ripeness. Seed to soon and your fruit will be sour and tart. Be patient and let it sit. Your patience will be rewarded with sweet, sweet berries! So you can recognize the difference – an unripe pom will have a smooth skin and may be a mottled pink/red color. A ripe pomegranate will have leathery, bumpy skin and be a uniform shade of dark red. Run your hands over the outside and you will actually be able to feel the lumps and bumps of the seeds just under the skin. This pom is ready to peel! The following quick video clip will show you just what I mean. When you’re ready to peel and seed your pom, simply take a serrated knife, slice of just the crown of the fruit at the top and carefully make four cuts just through the skin, not into the fruit. You’ll feel natural ridges in the surface of the fruit which will guide your cuts. Then, over a large bowl of water, gently pull each of the four sections apart and push the seeds right off of the peel and into the water below. You will end up with very few bruised or broken seeds and the vast majority perfectly plump and intact. The ripe seeds sink right to the bottom of the bowl, no errant seeds scattered around the kitchen, and the yellow membrane float on the surface. Skim the yellow leaves, or ‘floothia’ as we call them in my family, off and drain off the seeds below over the sink. This is the easiest, fastest way by far to separate this unusable, inedible part of the fruit. I do not like or ever recommend the wooden spoon method. It takes a while to get it right and can leave you with seeds flung hither and thither around your kitchen until you do. And worse, when done indelicately, you can end up with half of your seeds all beaten up! 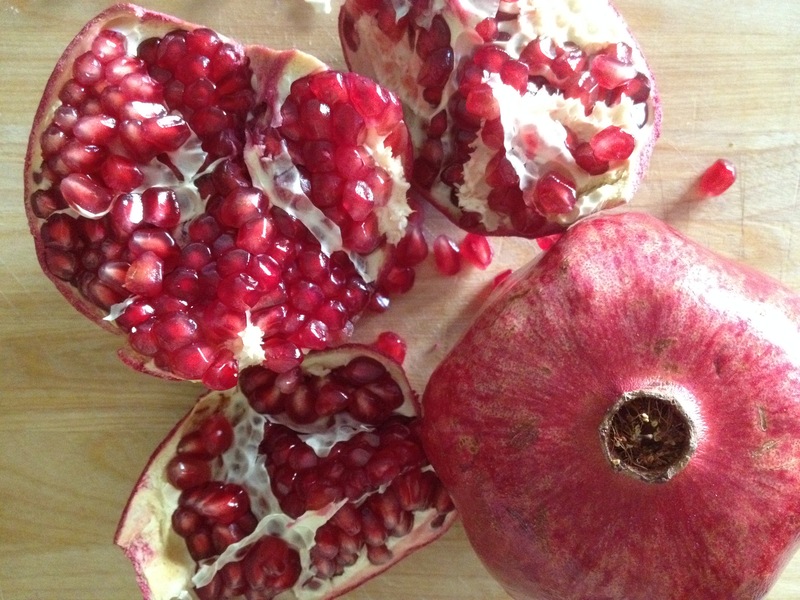 The season for pomegranates is the same in both Greece and the US – late October into November. In local groceries here in the Boston area, they’re everywhere in bushelfuls. We do get them every so often throughout the year up from South American countries but its a random event at best. Because the season is short, we recommend you stock up and FREEZE YOUR SEEDS! That way you can enjoy them whenever you like year round. 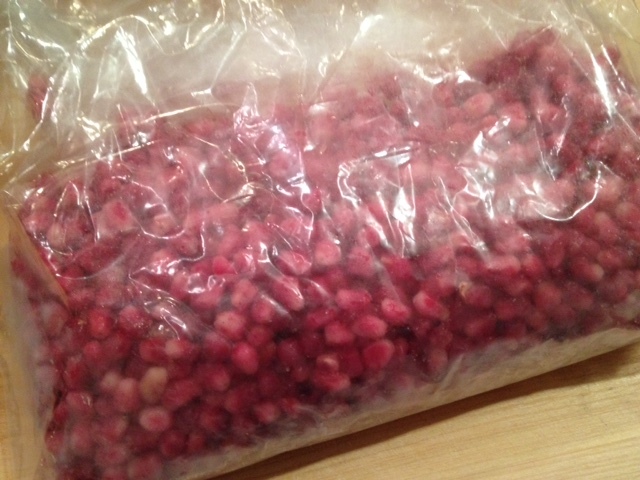 frozen pomegranate seeds ready to use whenever you need them! In a single layer, spread your pomegranate seeds out in a sheet pan and freeze, uncovered overnight. The next morning, just scoop the frozen seeds into a large plastic freeze bag or container and use them as you like! They take only a few minutes to thaw out so they’re really ready to go whenever you need them. I’ve had them frozen for up to 7 months and they were just as delicious as when I first put them up. A super quick and easy way to significantly and painlessly extend the pom season! 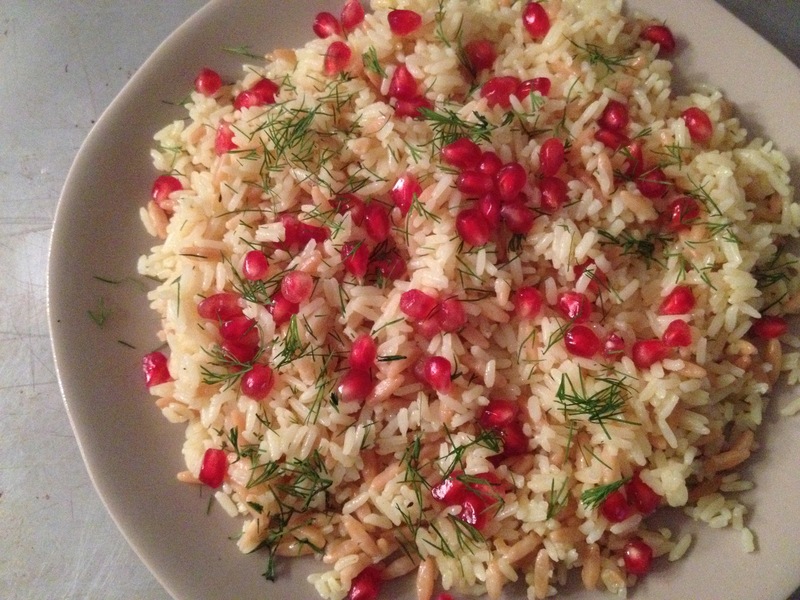 Pomegranate seeds are the perfect snack all on their own and I often keep a bowl out with a bit of chopped fresh mint mixed in for everyone to munch on during movie night. 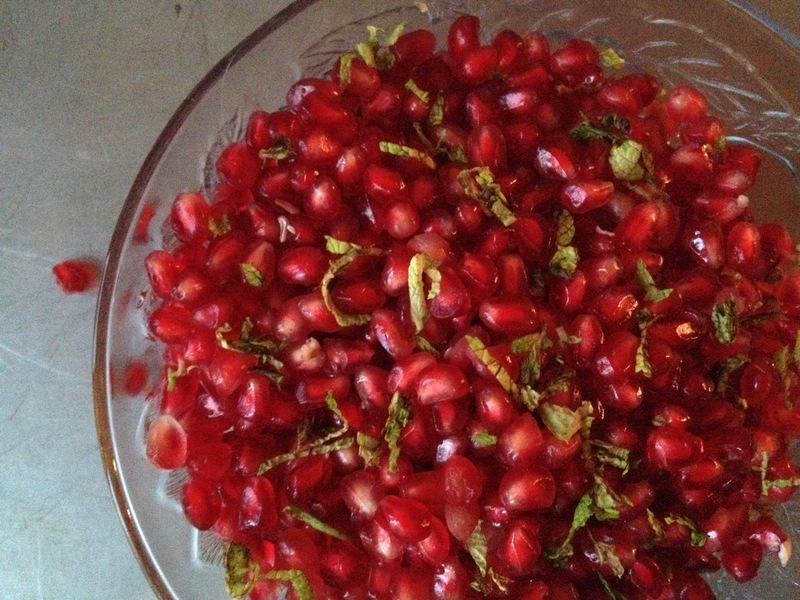 I actually experimented one night and had the bowl of minty pom seeds in between a bowl of MandM candies and a bowl of chips – guess which bowl was empty first 🙂 Pomegranates rule!! When in Greece one fall in the city of Corinth, I was served a snack of sweet pomegranate seeds with roasted almonds, plump golden raisins and salty Kalamata olives – amazing! I’ve recreated this meze (snack) often at home and though not something I probably would have come up with on my own, its really an incredibly good combination of flavors. Thank you for coming up with this concept.Am Greek-American and vegan and love your food ideas. 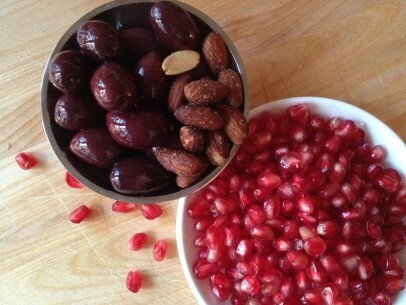 Pomegranate peeling was inspirational – will get some tomorrow and try your method! Great uses for poms, too.